It can be a challenge to design your home and trying to incorporate the ideas that you have in mind to create the perfect dream home in Vancouver. Using engineered flooring in home design simplifies the design process and the versatility allows you to create different looks for each section of the house that will suit the different members. Wondering if you can use engineered flooring for your basement in Vancouver? Perhaps you’re thinking about redoing the flooring for your basement or maybe you’re considering engineered flooring for your home. But now you’re asking yourself: Can you use engineered flooring for your basement? Well, the short answer is yes. But let us tell you more. There are different materials that you can choose for your basement floor and it all really depends on what type of room you want your basement to be, though there are other things that you need to take into consideration. Basements tend to be the most humid part of your house because moist air tends to sink to the lowest part of any home, even your own home. When the humid air come in contact with a concrete floor, which is usually cooler, condensation occurs. Because of this, traditional hardwood flooring should really not be used for basements. 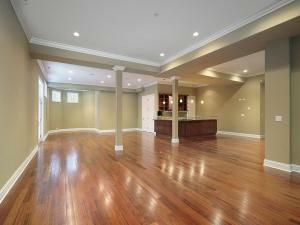 Fortunately, engineered flooring is a better option than hardwood flooring for a basement. This is because it’s far more resistant to moisture than hardwood due to the layers within engineered flooring. These layers help resist movement. Engineered flooring also won’t warp easily the way hardwood does when there’s a shift in temperature in your home. Another good thing about engineered flooring is that your flooring won’t be as cold as tile, for example. Before you get out there and purchase your engineered flooring, however, you need to make sure that your basement floor is smooth and leveled. If not, you would need to take some steps to even out your floor. An uneven floor can damage your new flooring. Do you have further questions about engineered flooring? Are you thinking of using engineered flooring for another part of your house in Vancouver? You can see our selection of engineered flooring or you can email us your question. Send an email to: bclaminate@gmail.com. It’s easy enough to think that the preparation for laminate flooring installation in your Vancouver home will take no time at all. However, one of the main things that you should check before the installation is whether or not the surface of the subfloor is even. You’ve installed your engineered flooring in your Vancouver home! Now it’s just a matter of caring for your flooring. Follow these tips for maintaining Engineered flooring.